Imagine a life without debt. Sounds fanciful? It doesn’t have to be. Here are some surefire ways that could help pay down your home loan debt. Making more – or larger – repayments than what you’re required to seems like a bit of a no-brainer when it comes to shedding your debt sooner. But do you know just how much you’ll save by doing so? AMP head of sales and marketing Glenn Gibson says making small additional payments will fast track your path to financial independence. Using a $500,000 home loan with an interest rate of 3.99% and a 30-year term as an example. “If you are paying monthly and you increase your repayments by $250 per month, you could actually save more than $60,000 in total interest over the full loan term and cut just over four years off your home loan,” Gibson says. Don’t be tempted by the smaller repayments you’ll initially be required to make if you select an interest-only home loan. Paying off only the interest means you’re paying none of the actual loan back, and you’ll eventually be required to play catch-up. For example, based on that $500,000 loan, if you chose to pay both the principal and interest, you’d repay around $2384 per month. However, if you chose an interest-only period of five years, you would pay around $1662 per month for the first five years, but then be required to pay $2636 monthly for the next 25 years. Over the course of the loan, you would end up paying about $32,000 in extra interest, by choosing interest-only. This shows that it is well worth making the principal and interest payment from the get go. If you’re currently making your home loan repayments monthly, try switching them to fortnightly, or even weekly, to match your pay cycles. In practical terms it means you’ll make an extra repayment every so often, without even realising it, and Gibson says you’ll be staggered at just how much you’ll save. “Using the $500,000 loan example again, your normal monthly repayments are approximately $2380. But if you were to make fortnightly loan repayments of $1190 you could save around $50,000 in total interest over the term of the loan and help reduce the term from 30 years to approximately 26 years,” he says. For example, using a credit card – which is effectively a small loan – will attract a significantly higher interest rate than larger loans like your home loan. If you are only paying the minimum repayments on your credit card each month, then consolidating your credit card debt and other debts into your home loan, may help slash the interest you’re paying. “The key to making this work is to cancel any credit cards you don’t need once you make the transfer, and then increase the amount you pay each month off your home loan to be the total you were paying across all your loans,” Gibson says. Ready to play the long game? The humble smashed avo has unwittingly become a pawn in the housing affordability debate, but there’s merit to the notion that making small sacrifices will pay off in the long run. Gibson says something as small as skipping that takeaway coffee every day and putting that money towards paying off your debt could be worth the sacrifice. “Let’s say a coffee costs $5 and every fortnight you were to skip five coffees and paid $25 each fortnight off your home loan. Over the term of a 30-year, $500,000 loan you would save more than $15,000 and possibly cut more than a year of repayments off the length of the loan,” he says. Offset accounts are a great way to reduce the amount of interest you’re charged on your debt. An offset account is a bank account linked to your home loan, with the amount of money in the account used to cut down your interest repayments. For example, if you have $100,000 left on your loan but $20,000 in your offset account, you’ll only be charged interest on $80,000. 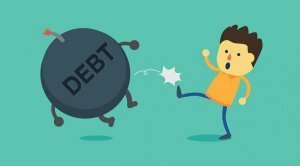 In the end, anything you do to either increase what you’re paying off your loan, or decrease what you owe, is going to help you become debt-free sooner.